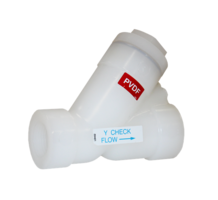 The YC Series Y-Check Valves are now offered with FPM o-ring seals in 1/2, 3/4 and 1 in. sizes and is made from polyvinylidene fluoride material. 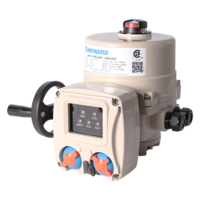 The unit is suitable for applications such as water and wastewater treatment, clean water technology, chemical feed systems, chemical processing and mineral processing. 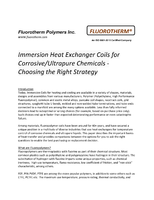 The product features a pressure rating of 150 psi at 70ºF and a maximum service temperature of 240°F. They are offered with either threaded or IPS socket fusion molded-in end connections. 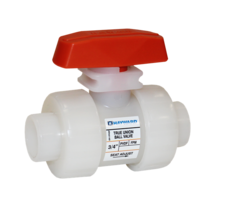 Clemmons, NC (November 6, 2018) - A true Industry first, Hayward Flow Control is proud to announce the launch of its YC Series Y-Check Valves in natural PVDF (Polyvinylidene Fluoride). The YC Series in PVDF is ideal for extreme corrosive media or sensitive media systems and higher temperature services. 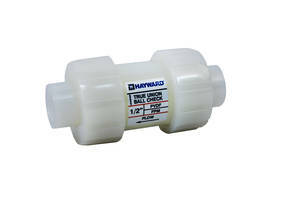 The PVDF YC Series Y-Check Valve is available with either threaded or IPS socket fusion molded-in end connections. The piston is made from PVDF material. FPM o-ring seals are standard. Sizes include ½”, ¾” and 1”. 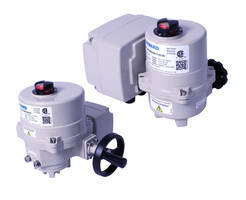 All sizes carry a pressure rating of 150psi / 10 bar Non-Shock at 70ºF / 23°C. Maximum service temperature is 240°F / 115°C. 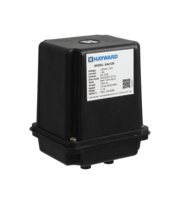 For more information, contact Hayward Flow Control at 1.888.429.4635 or by e-mail at hfcsales@hayward.com, haywardflowcontrol.com.